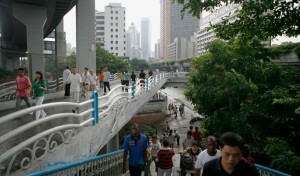 “Little North Road 小北路” is a photography and film exhibition by Daniel Traub exploring the social life and economies of a pedestrian bridge in Guangzhou, China. “Little North Road 小北路” raises complex questions concerning artistic collaboration, permission and privacy, while also challenging normative conceptions of Chinese identity and influence. Slought is a non-profit organization that engages publics in dialogue about cultural and socio-political change in Philadelphia, the world, and the cloud. Presented as part of The Print Center 100. On view September 17 – November 27. Opening Reception Thursday, September 17, 6:30 – 8:00pm. Closing reception and conversation: A Bridge Too Far: Authorship and Public Space, with Daniel Traub and Peter Barberie, Curator of Photographs at the Philadelphia Museum of Art, and Robert Pledge, Director of Contact Press Images, Tuesday, November 24, 6:30pm.